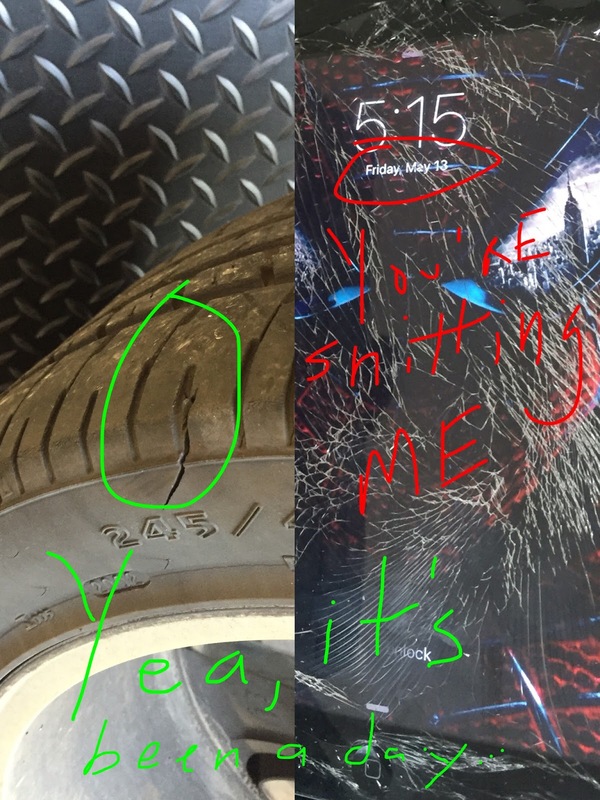 Caught a really bizarre flat tire today immediately after work & completely shattered my iPad screen upon arriving at home. Oh & I was completely unproductive on the job today - yea, as this post title states, it’s been a day! The devil has certainly been busy at work, but I’m far too blessed to be stressed so I’m not even gon’ cry about it. 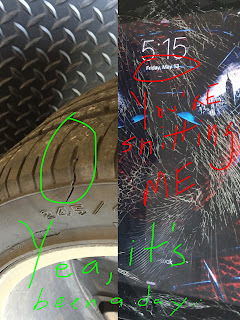 I was lucky enough to be in a familiar part of DC when I caught the flat tire, & though my tire began to rapidly lose air pressure upon puncture, I was able to make it safely to a nearby Exxon station on Benning Road, popped on the spare & kept my Friday afternoon rolling. Stopped by the NTB bought a new tire, it’s now mounted to the rim & ready for pick up later this evening. Last Mother's Day weekend I attended the commencement exercises of my alma mater, Howard University, here in our nation's capital. 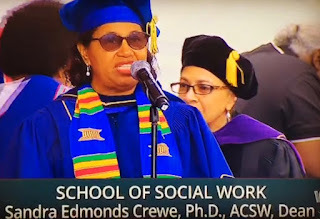 I'd thought the faces of over 2,400 new members of the real HU's great family would highlight the day, but much to my delight, the best part of the ceremony would actually be my very own mother (now the Dean of HU's School of Social Work) presenting & confirming her students' graduate degrees! What a way to kick-off the holiday weekend! 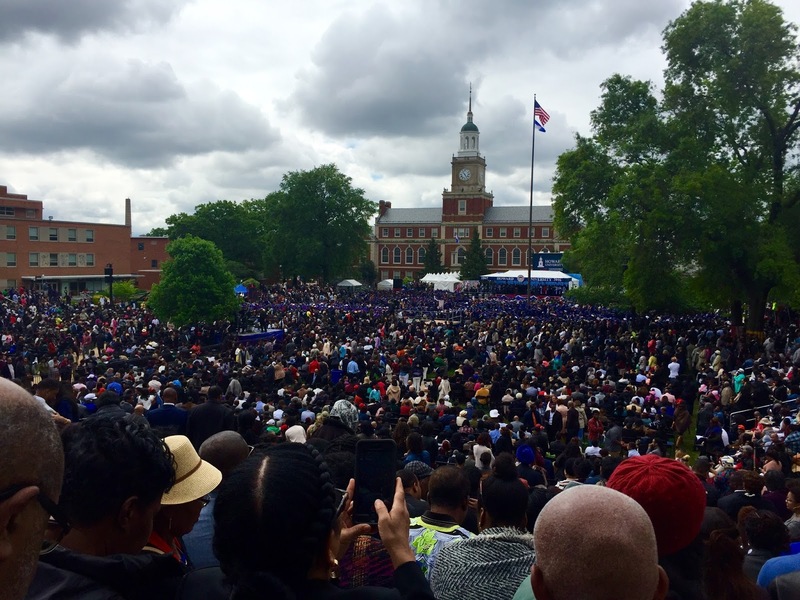 The weather cooperated, as it always does for an HU graduation, & everyone on the yard, including my mom, simply looked great. The camera really seemed to love her, as I'd later discover upon returning home to catch the live coverage on my DVR & she didn't flub any of her lines either, lol. Oh & by the way, the 44th president our great nation stopped by as well... “I know you’re all excited today. You might be a little tired, as well. Some of you were up all night making sure your credits were in order (laughter). Some of you stayed up too late, ended up at HoChi at 2am (laughter). Got some mambo sauce on your fingers (enormous laughter)…"
Now that's the Barrack Obama I've been waiting 8 years to hear from - maybe I won't give him such a hard time moving forward, lol. But all jokes aside, he really did deliver an empowering speech to the graduates, one that was relevant to everyone in attendance. A truly historic & monumental day on the Hilltop & I'm so very glad that I was able to take part. Now let me break-out this checkbook, I've got money to send uptown for some much needed infrastructure improvements over at the School of C! As of late, home surveillance has become my newest obsession, but as not to completely compromise the details of my top-secret security layout (lol), I'll just say that I've gone a little overboard - it's a little like baby London in here! Adults & children alike, should have absolutely NO expectation of privacy upon entering my home. It's not that I've had any issues with security, I simply enjoy having that added peace of mind, even when I'm away. Over the past several months, I've added quite a few enhancements to supplement the standard security system currently installed in my home, all of which have remote monitoring capabilities for the added ease of deployment of law enforcement or emergency personnel should something happen. Throughout the home, I'm now monitoring interior movement, air climate/carbon monoxide levels, lighting conditions, wireless data management, so-on & so-fourth. But in an attempt to at least preserve the sanctity of the sleeping quarters, I've managed to minimize the camera coverage in the most upper level of my home, but that area is indeed surveilled too, lls. Certainly, there's no way to completely prevent a break-in, but if one does indeed occur, it damn-sure won't be a secret to anyone & that's my primary goal. I love stuff just as much as the next man, but that's not at what motivated my efforts here... at the end of the day, the items I own aren't as important to me as the safety of those I love - their safety reigns paramount! In that regard, each of the above described upgrades were worth each & every penny spent.